One of the important changes in Warhammer Online's 1.4.6 patch involves the bolster mechanic. On the live servers, when players enter a RvR lake in Tier 4, their stats are increased to a level 40 equivalent. That used to be the cap, in 1.4 it was actually raised to 45 but hidden from the player. Once you surpass RR 80, you start getting those levels. In 1.4.6, the bolster will raise players to 45, if they are not already. Your character sheet will still say you are level 40, but your stats will get buffed. How much? That depends. Lets take a look at an example. My RP below is geared poorly at the moment, so keep that in mind. 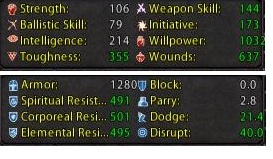 As you can see from the screenshots, my RP ends up with some buffs after the bolster. They are not very large, but a buff is a buff. On a tank character, for example, you'll see a greater armor improvement compared to mine. Currently, there is a bug on PTS which grants RR80+ players an extra bolster, but that should be taken care of soon. 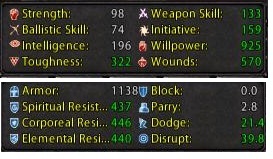 What I don't show here is the effect level 45 has on the combat formulas, which will also make life better for low players.